GRAND CHUTE, WI - The Wisconsin Timber Rattlers are set to help you make your holiday shopping easy this year. The Midwest League affiliate of the Milwaukee Brewers are announcing their holiday ticket packages, extended hours for the team store, and Cyber Weekend deals to make shopping as stress-free as possible! There are two Holiday Ticket Packages that are on sale now. 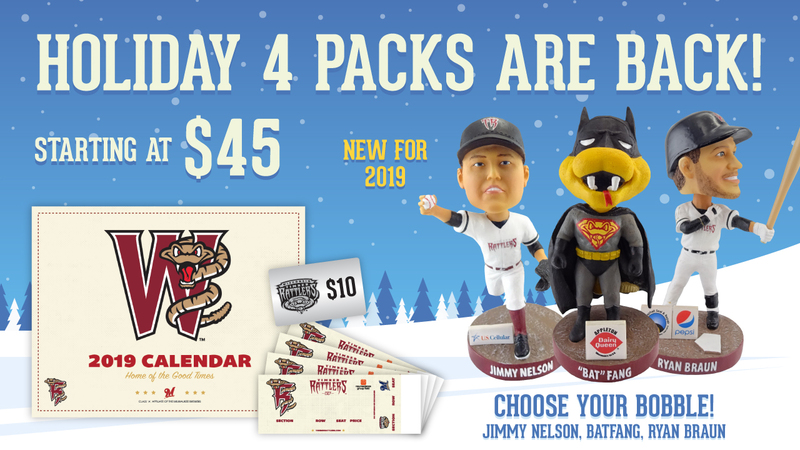 Ticket packages may be ordered from the Timber Rattlers Ticket Office in person, over the phone at (920) 733-4152 or (800) WI-TIMBER, or online. The Snake Pit Team Store will hold a Cyber Weekend Sale with FREE SHIPPING for online purchases of over $50 from Friday, November 23 through Monday, November 26. Select your items and enter the promo code "tratnation" to receive your discount. The store at Neuroscience Group Field at Fox Cities Stadium will be closed on Friday, November 23, but they will begin special extended holiday hours on Saturday, November 24 by being open from 10:00am to 3:00pm as a participant in the Shop Appleton First Small Business Saturday. If you make an in-store purchase of over $50 during Small Business Saturday, you will receive 15% discount. Make a purchase in person at the store and we will stamp your Small Business Saturday Passport (available online here or in the Thanksgiving Day edition of The Post-Crescent). Plus, you will receive a team logoed reusable shopping bag with a purchase on November 24.